It’s not just the Koch brothers: a state by state look at the forces driving school privatization. he ongoing wave of teacher strikes across the US is changing the conversation about public education in this country. From West Virginia to Arizona, Kentucky to Oklahoma, Colorado to North Carolina, tens of thousands of teachers have taken to the streets and filled state capitals, garnering public support and racking up victories in some of the nation’s most hostile political terrain. Even though the teachers who have gone on strike are paid well below the national average, their demands have gone beyond better salary and benefits for themselves. They have also struck for their students’ needs — to improve classroom quality and to increase classroom resources. Teachers are calling for greater investment in children and the country’s public education system as a whole. They are also demanding that corporations, banks, and billionaires pay their fair share to invest in schools. The teachers’ strikes also represent a major pushback by public sector workers against the right-wing agenda of austerity and privatization. The austerity and privatization agenda for education goes something like this: impose big tax cuts for corporations and the .01 percent and then use declining tax revenue as a rationale to cut funding for state-funded services like public schools. Because they are underfunded, public schools cannot provide the quality education kids deserve. Then, the right wing criticizes public schools and teachers, saying there is a crisis in education. Finally, the right wing uses this as an opportunity to make changes to the education system that benefit them — including offering privatization as a solution that solves the crisis of underfunding. Billionaire school privatizers. A small web of billionaires — dominated by the Koch brothers and their donor network, as well as the Waltons — have given millions to state politicians who will push their pro-austerity, pro-school privatization agenda. These billionaires lead a coordinated, nationwide movement to apply business principles to education, including: promoting CEO-like superintendents, who have business experience but little or no education experience; closing “failing” schools, just as companies close unprofitable stores or factories; aggressively cutting costs, such as by recruiting less experienced teachers; instituting a market-based system in which public schools compete with privately managed charter schools, religious schools, for-profit schools, and virtual schools; and making standardized-test scores the ultimate measure of student success. Regional corporate forces. Major corporations in each state, often from the fossil fuel industry, are key drivers and beneficiaries of the pro-austerity, tax-cutting policies that have gutted school funding — and now they are opposing the teachers trying to fix the mess these corporations created. Many of these corporations also fund and lead charter schools (which can drainfunding from traditional public schools), donate to pro-austerity/pro-education privatization school-board candidates, and advocate for policies like increased standardized testing, using inexperienced teachers to cut costs, and outsourcing school functions to private companies. Koch-backed think tanks. A slew of state-level front groups — many tied to the State Policy Network, a national network of think tanks funded by the Kochs, Mercers, Waltons, and other billionaires — serve as a key PR wing for the anti-teacher privatization agenda. We put together the following list to begin identifying which corporate actors are driving and profiting from austerity in the states where teachers have gone on strike. For each state we asked: Who are the main power players? What banks or corporations are taking money out of the public budget? Who are the major donors to politicians who are slashing public education budgets while doling out big tax breaks to corporations? Which one-percenters are bankrolling education privatization? This article lays out some information about the corporations, banks, and billionaires that teachers in Arizona, Colorado, Kentucky, Oklahoma, and West Virginia are up against. (We also include a table at the end that shows the biggest corporate beneficiaries of public subsidies). In Arizona, top individual tax rates have plummeted from 7 percent to 4.54 percent since 1990, and revenue from corporate income taxes have been more than halved in the past decade, dropping from $986 million in 2007 to $368 million in 2017. This austerity agenda has cut funding per student by nearly a fifth over the past decade — from $4,949 in 2008 to $4,157 in 2018. The Koch donor network also funds the Goldwater Institute, Arizona’s anti-teacher SPN affiliate. Trump backer Rebekah Mercer is on the Goldwater board, and a former Ducey official now heads up the Institute. Today, Arizona has proportionally more charter school students than any other state, and ALEC puts Arizona at the top of its Report Card on American Education. Furthermore, the Walton Foundation has funneled a whopping $4,294,000 (and possibly more) to pro-charter forces in Arizona since 2009 (more on the Waltons below). Arizona corporations fund the Arizona Education Project, which spent more than $1 million on pro-Ducey education ads before the teachers’ strike. AEP is backed by the Arizona Chamber of Commerce, the Service Group of America (a private food-service company), and Pinnacle West Capital, the parent company of Arizona Public Service, the state’s largest electric utility. Pinnacle West has poured big money into Arizona politics — top executives have already given Ducey over $130,000 for his 2018 run, not to mention millions of dollars in dark money that APS has put in play in other elections. Pinnacle supported Ducey during his 2014 campaign — its CEO even chaired Ducey’s inauguration committee. Both Pinnacle and Service Group of America have ties to the Koch network. Since 2004, Oklahoma has cut the top personal income tax rate from 6.65 percent to 5 percent, abolished the estate tax, and exempted capital-gains income from being taxed — all while the state faced a billion-dollar budget shortfall. The fossil fuel industry drives the state’s austerity agenda. Three companies — Devon Energy, Chesapeake Energy, and Continental Resources, whose CEO Harold Hamm is worth $18.8 billion — succeeded in getting an ultra-low tax rate of just 2 percent on new drilling wells for the first three years of operations. In 2015 alone this amounted to a $470 million subsidy for the industry. All told, general funds are down 35 percent in Oklahoma since 2006. Meanwhile, spending on students has dropped 28 percent per pupil since 2008, and teacher salaries are ranked forty-eighth in the nation. Oklahoma governor Mary Fallin has close ties to the Koch network. She received an award from ALEC in 2013, spoke at an ALEC summit in 2008, and has been an ALEC “Legislator of the Year.” The Koch-backed SPN has three affiliates and associates in Oklahoma — the Oklahoma Council of Public Affairs, the 1889 Institute, and the EFoundation. The EFoundation’s advisory council includes Todd Lamb, the current Lieutenant Governor, and oil and gas industry billionaires like T. Boone Pickens. The head of the 1889 Institute used to be at the Goldwater Institute, and many staff from the OCPA have ties to the Koch donor network-backed web of think tanks. Nor is it just SPN affiliates pushing the privatization agenda in Oklahoma — billionaire charter school pusher Eli Broad has been a key backer of school privatization there. West Virginia has steadily slashed corporate taxes since 2006. It cut its corporate net income tax rate from 9 percent to 6.5 percent and phased out its business franchise tax. The West Virginia Center on Budget and Policy estimates that these and other cuts have gutted state revenue by more than $425 million a year. Because of this, funding per student has dropped 11 percent in West Virginia since 2008, and teacher salaries are ranked forty-ninth in the nation. Oil, gas, and coal dominate West Virginia and are key pushers of austerity. For example, Bob Murray — CEO of Murray Energy, the state’s largest coal company — pushed hard for cuts to the state’s severance tax on oil, gas and coal companies (the state legislature passed a 40 percent cut to the severance tax in 2016). Murray has been a major GOP donor — in 2014 alone, he spent $250,000 trying to get Republican lawmakers elected. Current Governor Jim Justice is a coal baron — and the state’s only billionaire — who owes $15 million on taxes even though he’s received $379,799 in public subsidies. In Kentucky, Governor Matt Bevin has pushed tax cuts for corporations and the ultra-wealthy and cuts to public services since he took office in 2015. A Lexington Herald-Leader investigation found that Kentucky gives away $13 billion in tax expenditures (a mix of accumulated tax breaks, tax credits, and incentive payments involving tax money) every year — more than the state collects. In the early 2000s, subsidiaries of the now-bankrupt coal giant Peabody Energy received $266 million in tax subsidies from Kentucky. Amazon has received $111 million in tax subsidies from the state. Even though Governor Bevin wasn’t the Koch’s first choice for Kentucky governor, he has loyally pushed the billionaire donor network’s agenda. Bevin recently spoke at a Koch donor retreat, and the Koch-backed American for Prosperity praised his new work requirements for Medicaid recipients. Americans for Prosperity has orchestrated the systematic defunding of Kentucky’s public education system — it has played an integral role in bringing charter schools to Kentucky and advocated for tax cuts for the ultra-wealthy that rob Kentucky’s schools of desperately needed revenue. Out of the forty-four states that levy a corporate income tax, Colorado ranks the third lowest. The state has doled out at least $732 million in tax subsidies to corporations over the past ten years. The single largest subsidy, worth $300 million, went to the Gaylord Rockies Resort and Convention Center, owned by Starwood Property Trust, the largest commercial mortgage Real Estate Investment Trust in the United States. Starwood is run by billionaire Barry Sternlicht, whose investment empire includes single-family rental homes and Westin Hotels. Teachers in the state are supporting a ballot initiative that would fund public education by raising taxes on corporations and people earning more than $150,000. The ballot initiative would certainly ensure that Colorado’s eleven billionaires and other wealthiest residents pay their fair share to fund the state’s public education system. These billionaires include Philip Anschutz, the fossil fuel and real estate billionaire who is worth $13 billion; Charles Ergen, the DISH Network Chairman who is worth $13.4 billion; and Kent Thiry, the politically active CEO of DaVita Healthcare. Anschutz and his family have spent hundreds of thousands in campaign contributions to elect state legislators and school-board members, while also financing charter schools in the region, including KIPP:Colorado. Thiry has spent over $75,500 in school board elections, while DaVita executives have influential positions at organizations including KIPP:Colorado and Colorado Succeeds, an organization for businesses aiming to transform Colorado’s education system. Anadarko Petroleum and Noble Energy, the top energy producers in the state, have been major donors to the pro-corporate agenda in Colorado. The two companies have spent over $22 million combined in campaign contributions — primarily to various pro-business ballot initiatives and Republican candidates — at the state level. Anadarko and Noble are also leaders in several corporate trade organizations, including the Colorado Association of Commerce and Industry, the Metro Denver Chamber of Commerce, and Colorado Concern. These corporate trade groups have advocated for keeping taxes low for corporations and the ultra-wealthy, as well as leaving corporate-tax loopholes intact, while simultaneously promoting education privatization and charter school expansion. Wells Fargo, Colorado’s biggest bank, Xcel Energy, the state’s largest utility, and Molson Coors are also driving forces behind the Colorado Association of Commerce and Industry and the Metro Denver Chamber of Commerce. Wells Fargo saved $3.35 billion in taxes last year due to the federal tax-reform bill — even as it avoided paying taxes in Colorado that could help fund public services. The Walton Family also has Colorado ties. Nationally, the Walton Family Foundation has been one of the biggest funders of charter schools and education privatization. The foundation estimates that it has provided startup funds to one out of every four charters in the country. The foundation also funds the State Policy Network (mentioned above). In 2016, it announced a $1 billion initiative to expand charter school and other choice initiatives even more over five years. In 2016 alone, the Walmart Family Foundation provided $60,000 to the Colorado League of Charter Schools, $250,000 to education privatization organization Colorado Succeeds, and at least $100,000 to KIPP:Colorado. While many of the Waltons live in California and Arkansas, Denver has its very own Walton family heir — Ben Walton, a board member at the Walton Family Foundation. Of course, Walmart is also a major beneficiary of the decades-long strategy to cut corporate taxes. North Carolina has implemented some of the most aggressive tax cuts for corporations and the wealthy in the entire US, and it’s home to some of the most aggressive right-wing and school privatization forces in the country as well. Similar to teachers in other states, North Carolina teachers are making demands to reverse the crisis created by these corporate forces and their austerity agenda. These demands include a rise in per-pupil spending, $1.9 billion to fix crumbling schools and large class sizes, an end to corporate tax cuts until per-pupil spending and teacher pay reach the national average, and hundreds of new nurses, social workers, and counselors. North Carolina teacher pay ranks thirty-ninth in the nation, and teachers have experienced a 9.4 percent decline in real income since 2009. Whereas the national average of per-pupil spending is $11,642, it is significantly less in North Carolina at only $9,329. Moreover, as we discuss below, corporate school-privatization advocates have succeeded to reallocating public education funds into the coffers of private and charter schools. This defunding of public education is the product of one of the deepest waves of tax cuts for corporations and the wealthy in the entire US. These tax cuts have benefited big businesses and the super-rich tremendously — the top 1 percent of North Carolinians have received more than a one-third of the money from the tax cuts — but gutted state revenues for public services like schools. In 2013, the GOP-dominated North Carolina state legislature approved a plan that cut corporate taxes from 6.9 percent to just 3 percent by 2017. According to the Denver Post, this is the lowest corporate tax rate in the nation — though still not low enough for North Carolina plutocrats and conservatives, who are lowering it even more next year to 2.5 percent. In addition to this, the personal tax rate, which taxed the wealthiest at 7.75 percent, was turned into a 5.75 percent flat tax, which was lowered again to 5.49 percent in 2017 and it set to fall to 5.25 percent in 2019. On top of all this, North Carolina abolished its estate tax while boosting sales taxes on things that would disproportionately hit working people, like car repairs. These tax cuts have devastated state revenues that go into funding services like public schools. In 2017, the North Carolina Justice Center wrote that tax cuts from 2013 to 2017 would result in $3.5 billion less revenue than before the tax cuts were implemented (at most, economic growth in the state made up for only about one-third of these losses). Meanwhile, the North Carolina Legislature’s Fiscal Research Division projects a budget shortfall of at least $1.2 billion in 2019, which is 5 percent of the total state budget. As a result of all this, real spending on per-pupil spending is down, and there are 10,000 fewer public teachers in the state. According to the Institute on Taxation and Economic Policy, since 2009–2010 state funding for textbooks has declined 45 percent, funding for supplies and materials has declined 55 percent, and funding for technology in schools has declined 59 percent. Earlier this month, the State Board of Education pleaded with state leaders to hold off on a $5 million cut to the school budget planned for July, which comes on top of another $3 million cut last year. As mentioned, this damaging agenda of tax cuts and public school defunding has been driven by powerful corporate forces and their far-right allies. A key player has been Art Pope, a multimillionaire who is the founder and CEO of Variety Wholesalers, a chain of hundreds of discount stores based in North Carolina. Pope’s net worth is unclear — he denies that he’s a billionaire, though he has spent tens of millions on state politics and a 2011 story said his family foundation may have $150 million in assets. 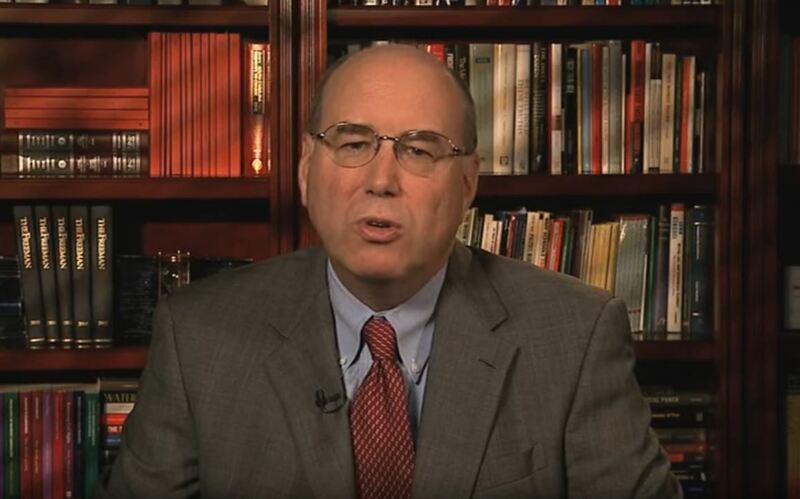 Art Pope, right-wing North Carolina multimillionaire driving austerity policies. Pope has bankrolled the conservative austerity agenda in North Carolina as well as reactionary causes like HB2, the so-called “Bathroom Bills” that discriminated against transgender people. He has spent at least $55 million on conservative think tanks and advocacy groups — and this number is from 2014. After throwing millions into pushing a far-right agenda in North Carolina, then-Governor Pat McCrory even made Pope his budget director — quite literally letting this big donor become a major architect of the state’s austerity agenda (Pope’s political donations stopped when he was in government, but they shot back up when he left the position in late 2014). Pope is a key player in the same donor network as the Koch brothers. He is a funder of American for Prosperity (which he gave $215,000 to in 2015–2016) and dozens of other far-right, billionaire-backed groups that push the austerity and privatization agenda. In particular, Pope bankrolls a slew of State Policy Network (SPN) affiliates and associates. The SPN is an astroturf network of thinks tanks that pushes school privatization and has issued guidelines — that were leaked to the media — on how to discredit striking teachers. North Carolina SPN affiliates and associates include the John Locke Foundation, the Civitas Institute, and the Jesse Helms Center. Pope gave these three groups a combined $3,836,0000 in 2015–2016, and the John Locke Foundation and Civitas Institute in particular have been big opponents of teachers, publishing a stream of anti-teacher, pro-school privatization articles in the lead up to North Carolina teachers’ actions. (The Civitas Institute also created a repugnant database of those arrested in Moral Monday protests that included their mugshots). While Pope has been a big driver of North Carolina’s far-right austerity and privatization agenda, other corporate forces have pushed and benefited from that same agenda. One big player is Duke Energy, a major fossil fuel and utilities corporation based in North Carolina. The board chair of the North Carolina Chamber of Commerce, David Foundation, is the North Carolina president of Duke Energy, and Duke is one of the Chamber’s foundation investors. Pat McCrory, who was governor when the state legislature passed its huge tax cuts, and who appointed Art Pope as his budget director, worked at Duke Energy for twenty-eight years prior to entering politics. McCrory hosted a private dinner with Duke CEO Lynn Good and other Duke executives at the Governor’s mansion in 2015. Good is widely seen as one of the most powerful people in the state. In the past, Duke has been tied to the state’s school privatization movement. Two of North Carolina’s four billionaires, Jim Goodnight and John Sall, co-founded and are top executives of SAS, a business analytics software vendor based in the state. Goodnight and Sall together are worth almost $15 billion. Goodnight and former Governor McCrory are friends, and Goodnight is a big political big donor and is viewed as influential in North Carolina politics. Other major corporations with their headquarters in North Carolina include Bank of America and Nucor. Corporations in North Carolina have also benefited from close to $5.5 billion in subsidies, most of it since 2008, according to Good Jobs First. The biggest beneficiaries of corporate tax subsidies include Apple (which has received over $360 million in subsidies), Dell (which has received over $303 million in subsidies), and Fidelity Investments (which has received over $105 million in tax subsidies). These corporate forces that have benefited from North Carolina’s huge tax cuts have also created conditions for the state to become a laboratory for school privatization. A leader of Parents for Educational Freedom in North Carolina, or PEFNC — a big beneficiary of Walmart money with ties to Betsy DeVos, which we discuss below — remarked that “you’d be hard-pressed to find another state that has done so much in education reform.” One big thing that has paved the way for this school privatization has been the rise of vouchers — with different titles like Disabilities Grant, Opportunity Scholarship, Education Savings Account — that have channeled public revenue away from public schools and into the private and charter school system. The Waltons — heirs to the Walmart fortune — have intervened in North Carolina to push school privatization (Walmart is also the biggest private employer in North Carolina). Since 2009 the Walton Foundation has channelled a whopping $4,635,000 to PEFNC. In February, PEFNC’s president left the organization to become national director for state teams and political strategy for the American Federation for Children (AFC) — the school-privatization advocacy group that was founded by Betsy DeVos. The AFC funded the PEFNC while DeVos was in charge of it. As the Waltons’ actions show, the school privatization push in North Carolina gets a lot of money from out of state. Another example of this is Oregon multimillionaire John D. Bryan, who runs a charter school network with thirteen schools in North Carolina. Bryan threw $600,000 into North Carolina politics to ultimately help pass a law allowing for the takeover of low-performing schools in the state. Now, Bryan’s charter network, TeamCFA, is being recommended to partner on the takeover of several schools. As all this shows, striking teachers across the US are taking on some powerful forces — the billionaires and corporations that are driving austerity, propping up far-right politicians, and pushing school privatization. The strikes may be occurring in different states, but they all face similar corporate forces and a similar agenda that is the source of the chronic underfunding of public education. Teachers get this — and it’s part of the reason their demands have gone well beyond things like (well-deserved) pay raises and protection of benefits. As the teachers’ fight continues, it will be important to continue to identify and map out the key corporate players behind austerity and school privatization — so as to better challenge their damaging agenda. All data compiled from the Good Jobs First Subsidy Tracker 1 and Subsidy Tracker 2. 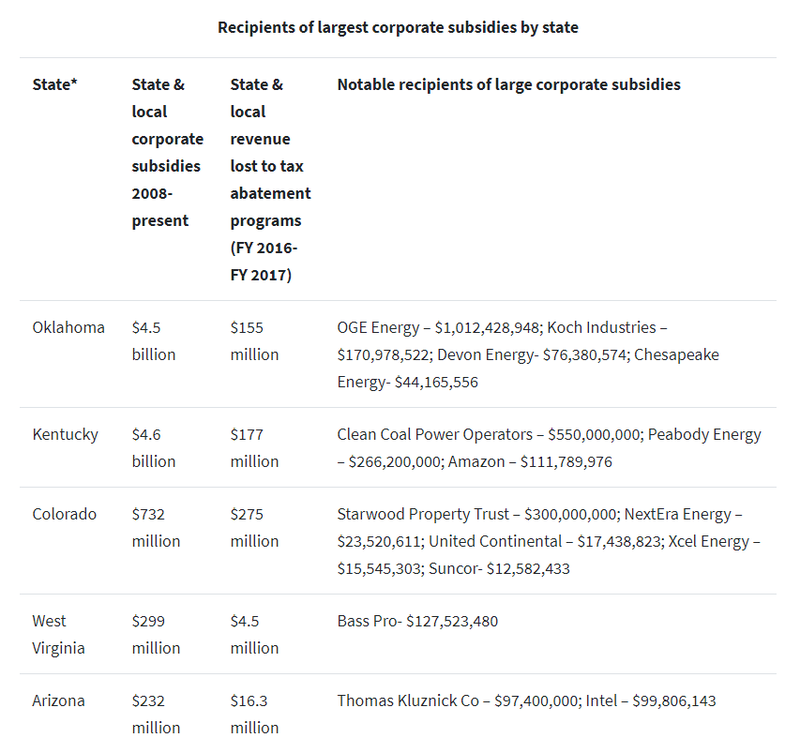 The quality of subsidy disclosure data varies significantly from state to state, so in some cases these numbers are likely significantly lower than the actual amount states are devoting to corporate subsidies. Thinks of these numbers as “at least,”; for example, Oklahoma has given corporations tax subsidies totaling at least $1.5 billion since 2008. Posted in Accountability, Advocacy, Charter School, Department of Education, Education Budget, Educators Protest, Every Student Succeeds Act, Funding For Education, No Child Left Behind Act, School Choice and tagged "Standing Strong for Public Education", Accountability, Advocacy, Department of Education, Diversity, Education, Equity, Every Student Succeeds Act (ESSA), Federal Education Policy, High-Needs Students, NEAExecutiveCommittee, Pensions, Public Education, School Choice, State Budget, Students, Testing and Accountability. Bookmark the permalink.